There are approximately 100 species of clostridia bacteria that can inhabit the gastrointestinal tract of humans. Not all of these clostridia are disease causing, but a certain few can lead to serious illness in susceptible individuals. Organic acids are derived from the metabolic conversion of dietary protein, fats and carbohydrates, in addition to bacterial origin in the gut. These markers provide a unique profile into cellular energy status, neurotransmitter metabolism, nutrient deficiencies, intestinal bacterial metabolism and detoxification. The Organic (Metabolic) acids we all excrete in our urine every day, represent key intermediary compounds of the many internal biochemical pathways underway within the body, as well as the metabolism of many exogenous compounds also. In this 1 hour webinar Dr. Shaw explains the role of organic acids in human metabolism and provides a detailed guide on how to interpret results from the OAT. The OAT from The Great Plains Laboratory offers the most complete and accurate evaluation of intestinal yeast and bacteria available. It is the only OAT that distinguishes between beneficial and harmful bacteria. It also detects specific toxic metabolites of Clostridia bacteria, which are commonly missed by conventional culture methods, including unique markers for 4-cresol and HPHPA. The toxins released by toxic Clostridia metabolites can inhibit key neurotransmitters in the brain, including the conversion of dopamine to norepinephrine, leading to or exacerbating the symptoms of a variety of neuropsychiatric and behavioral disorders, such as depression, bipolar disorder, and autism. Clostridia infection is also associated with gastrointestinal disorders, including irritable bowel syndrome, Crohn’s disease, and ulcerative colitis. Overgrowth of Candida albicans, perhaps the most common form of yeast in the body, can build up toxins that are associated with fibromyalgia, migraines, chronic fatigue syndrome, poor concentration or “brain fog”, onset or magnification of symptoms of depression and psychosis. Candida can also become invasive, attaching to the intestinal wall, and causing “leaky gut” syndrome, which can magnify food allergies, impede absorption of vitamins and minerals, and cause a variety of intestinal disorders. Factors which can cause intestinal yeast overgrowth include oral antibiotic use, excessive sugars in the diet, mold or other toxic environmental exposure, selective or combined immune deficiencies, and genetic irregularities. Excess Candida burdens mitochondrial function and produces elevated levels of oxalates. Once any yeast or bacterial abnormalities are detected, there are a variety of treatment options available, including antifungal or antibacterial products, probiotic supplementation, vitamins, antioxidants, and dietary modification. Patients and physicians have reported significant improvement upon treatment, including decreased fatigue, regular bowel movements, increased energy and alertness, increased concentration, improved verbal skills, less hyperactivity, better sleep patterns, and decreased abdominal pain. The Organic Acids Test includes several nutritional markers, showing essential vitamin and antioxidant levels, including vitamins B12, B6, B5, B2, and C, Coenzyme Q10, N-Acetylcysteine, and Biotin (Vitamin H). Deficiencies of these vitamins and antioxidants are affiliated with a variety of chronic health issues. A diet lacking in adequate nutrients affects our overall health. Many people with chronic illnesses and mental health disorders show significant deficiencies of important vitamins and other nutrients. Malnutrition due to deficiencies in specific micronutrients impairs the immune system. The most consistent abnormalities are seen in cell-mediated immunity, complement system function, cytokine production, and antibody affinity. The Organic Acids Test measures eight specific ketones and fatty acid metabolites. Elevated levels of these fatty acids can be indicators of protein malnutrition, type I diabetes, severe GI Candida overgrowth, various genetic disorders, and cause hypoglycemia and lethargy. The Organic Acids Test measures levels of HVA (homovanillic acid) and VMA (vanillylmandelic acid), the metabolites of the neurotransmitters, dopamine and epinephrine/norepinephrine. It also measures the ratio of the two metabolites. Elevated HVA and decreased VMA may be caused by Clostridia infection or lead toxicity. An elevated ratio is often the result of decreased conversion of dopamine to norepinephrine by the enzyme, dopamine beta-hydroxylase. This inhibition is commonly caused by Clostridia by-products, including HPHPA, 4-cresol, and 4-hydroxyphenylacetic acid, which are also measured in the OAT. The Organic Acids Test also reports levels of quinolinic acid. Increased values of this marker may be caused by chronic inflammation from microbial infections, central nervous system degeneration, excessive tryptophan supplementation, and even exposure to phthalates. Quinolinic acid is considered neurotoxic at very high levels due to over stimulation of nerve cells, leading to premature nerve cell death. Mitochondria are the energy factories in our body and contribute to metabolizing biochemicals needed for optimum health, such as synthesis of certain hormones, cholesterol metabolism, neurotransmitter metabolism and ammonia metabolism. The Organic Acids Test has several markers for mitochondrial function, including six Krebs cycle metabolites and two specific amino acid metabolites. Increased values of these metabolites can indicate mitochondria energy pathway dysfunction and deficiencies in a variety of important vitamins and enzymes needed for optimal mitochondrial health. The Great Plains Laboratory, Inc. is the only lab that includes markers for oxalate metabolism in the Organic Acids Test. Elevated oxalates may indicate the genetic diseases, hyperoxaluria type I and type II. Build-up of oxalates can cause kidney stones. The Organic Acids Test includes important indicators of the body’s detoxification abilities, including those for glutathione levels. Glutathione is one of the most important and powerful antioxidants, and is often deficient in autism and other chronic conditions. When an individual is prone to oxidative stress, they are also more susceptible to opportunistic pathogens. These pathogens can hinder, either directly or indirectly, proper digestion and create further oxidative stress in the body. Unless addressed, this vicious cycle will continue to inhibit the various chemical pathways necessary for proper neurological and immune function. Another important marker included in the Organic Acids Test for detoxification is orotic acid. High levels of orotic acid can be caused by dysbiosis. Elevations of this marker are most commonly associated with ammonia toxicity. Elevated ammonia may result from drug toxicity to the liver, viral liver infection, or inborn errors of ammonia metabolism. Ammonia excess affects brain tissue, causing symptoms such as headaches, insomnia, confusion, inability to concentrate, anxiety, and even delirium. Eliminating yeast overgrowth can be an effective method of reducing autistic symptoms. Microbial overgrowth can be measured by urinary organic acids analysis of yeast and bacteria metabolites. The test also helps to identify indicators of methylation problems associated with autism. Many children on the autism spectrum have an overgrowth of certain Clostridia species, which produce compounds such as HPHPA (3-(3-hydroxyphenyl)-3-hydroxypropionic acid) and 4-cresol. HPHPA and 4-cresol may disrupt dopamine metabolism by interfering with the enzyme, dopamine beta-hydroxylase. HPHPA is a potent toxin with profound neurological effects in autism, which can cause moodiness, tantrums, extreme anxiety, aggression, self-injurious behavior, and digestive problems. The Great Plains Laboratory is the only lab that measures oxalates as part of an organic acids test. A great deal of research in recent years indicates that oxalate treatment is at the core of autism treatment. 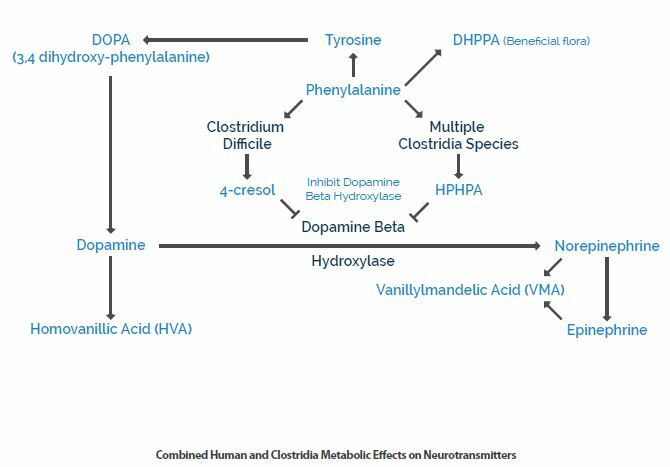 Proper treatment of Clostridia overgrowth, which produces excessive HPHPA and 4-cresol has markedly reduced or eliminated symptoms in patients with Schizophrenia, OCD, Depression, and other mental health disorders by balancing neurotransmitter levels. Overgrowth of yeast is associated with depression, memory impairment, behavioral disorders, low energy levels, hyperactivity, and a burdened immune system. Severe yeast overgrowth can impede vitamin and mineral absorption, leading to excess oxalate levels, and inadequate health. High levels of quinolinic acid are implicated in Alzheimer’s Disease, Huntington’s Disease, Depression, Dementia, and other psychiatric and neurological conditions. The Organic Acids Test detects levels of malic acid, which, when elevated simultaneously with citric, fumaric, and alpha-ketoglutaric acids, strongly suggests cytochrome C oxidase deficiency, indicating dysfunction in the mitochondrial energy pathways. The marker, 3-methylglutaconic acid in high values indicates a reduced ability to metabolize the amino acid, leucine. This abnormality is found in the genetic disease, methylglutaconic aciduria and in mitochondrial disorders. Another marker in the Organic Acids Test indicating genetic disease is 3-hydroxyglutaric acid. This metabolite is associated with glutaric aciduria type I, which is caused by a deficiency of glutaryl CoA dehydrogenase, an enzyme involved in the breakdown of lysine, hydroxylysine, and tryptophan. In this specific disorder, other organic acids such as glutaric and glutaconic acids will be elevated as well. The Great Plains Laboratory Organic Acids Test is very sensitive and can differentiate between harmful and beneficial bacteria, which is unique among tests for Clostridia. It is also the only organic acids test available that measures HPHPA, one of the primary toxic metabolites of Clostridia. In the sample results below, the patient has a high level of HPHPA, but a low level of 4-cresol, the main marker for C. dificile. Other tests that only measure 4-cresol, and not HPHPA, would have missed this harmful bacterial overgrowth. Another benefit to The Great Plains Laboratory Organic Acids Test is that it evaluates Clostridia metabolites that can inhibit metabolism of important neurotransmitters. As shown in the sample results below, the test measures homovanillic acid (HVA), a metabolite of dopamine, as well as vanillylmandelic acid (VMA), a metabolite of norepinephrine and epinephrine. Clostridia bacteria can produce toxins that may inhibit the conversion of dopamine to norepinephrine. This can lead to a build-up of dopamine and a disruption in the dopamine to norepinephrine ratios. By assessing these metabolites, the Organic Acids Test is able to better determine the possible underlying cause of many different conditions. HPHPA (3-(3-Hydroxyphenyl)-3-Hydroxypropionic Acid) was first discovered by M. Armstrong and K. Shaw more than 50 years ago, when they found this compound to be elevated in patients of all types in mental hospitals. The source of this compound is a small number of Clostridia species. William Shaw, Ph.D., Director of The Great Plains Laboratory, Inc., re-discovered this compound in many patients with psychiatric diseases during research at a major pediatric hospital. Significant decreases in symptoms of schizophrenia, autism, seizure disorders, tic disorders, depression, chronic fatigue syndrome, and ADD/ADHD have been reported after testing for and treating these specific Clostridia infections. A number of physicians have indicated that this marker is one of the most clinically significant biochemical markers that they use for symptom management. The Organic Acids Test by The Great Plains Laboratory, Inc. is the only OAT on the market that evaluates levels of oxalates in urine. Oxalate (and its acid form, oxalic acid), is an organic acid that is primarily derived from three sources: the diet, fungus (such as Aspergillus and Penicillium), possibly Candida, and also human metabolism. Oxalic acid is the most acidic organic acid in body fluids and is used commercially to remove rust from car radiators. Antifreeze (ethylene glycol) is toxic primarily because it is converted to oxalate in the body. Two different types of genetic diseases are known in which oxalates are high in the urine, hyperoxalurias type I and type II, which can also be determined from the Organic Acids Test. Foods especially high in oxalates are often foods thought to be otherwise healthy, including spinach, beets, chocolate, peanuts, wheat bran, tea, cashews, pecans, almonds, berries, and many others. People now frequently consume “green smoothies” in an effort to eat “clean” and get healthy, however, they may actually be sabotaging their health. The most common components of green smoothies are spinach, kale, Swiss chard, and arugula, all of which are loaded with oxalates. These smoothies also often contain berries or almonds, which have high amounts of oxalates as well. Oxalates are not found in meat or fish at significant concentrations. Daily adult oxalate intake is usually 80-120 mg/d. A single green smoothie with two cups of spinach contains about 1,500 mg of oxalate, a potentially lethal dose. High oxalates in the urine and plasma were first found in people who were susceptible to kidney stones. Many kidney stones are composed of calcium oxalate. Stones can range in size from the diameter of a grain of rice to the width of a golf ball. It is estimated that 10% of males may have kidney stones some time in their life. Because many kidney stones contain calcium, some people with kidney stones think they should avoid calcium supplements. However, the opposite is true. When calcium is taken with foods that are high in oxalates, oxalic acid in the intestine combines with calcium to form insoluble calcium oxalate crystals that are eliminated in the stool. This form of oxalate cannot be absorbed into the body. When calcium is low in the diet, oxalic acid is soluble in the liquid portion of the contents of the intestine (called chyme) and is readily absorbed from the intestine into the bloodstream. If oxalic acid is very high in the blood being ltered by the kidney, it may combine with calcium to form crystals that may block urine ¬ ow and cause severe pain. In addition to kidney disease, individuals with fibromyalgia and women with vulvar pain (vulvodynia) may suffer from the effects of excess oxalates. Oxalate crystals may also form in the bones, joints, blood vessels, lungs, thyroid, and even the brain, possibly impeding their proper function. In addition, oxalates in the bone may crowd out the bone marrow cells, leading to anemia and immunosuppression. Oxalate crystals cause pain and damage to various tissues, due to their sharp, physical structure, and may also increase inflammation. Iron oxalate crystals may cause significant oxidative damage and diminish iron stores needed for red blood cell formation. Oxalates may also function as chelating agents and may chelate many toxic metals, such as mercury and lead. Unlike other chelating agents, oxalates trap heavy metals in the tissues, leading to metal toxicity. Oxalates also interfere with the Krebs cycle’s glucose metabolism and can inhibit absorption of essential minerals necessary for optimum health. Studies show that oxalates in the urine are much higher in individuals with autism than in non-autistic children. In the figure below, it shows that 36% of the children on the autism spectrum had values higher than 90 mmol/mol creatinine, the value consistent with a diagnosis of genetic hyperoxalurias, while none of the non-autistic children had values this high. 84% of the children on the autism spectrum had oxalate values outside the normal range (mean ± 2 sd). None of the children on the autistic spectrum had elevations of the other organic acids associated with genetic diseases of oxalate metabolism, indicating that oxalates are high due to external sources. A low-oxalate diet is being used extensively to treat children with autism and other disorders. Researcher, Susan Owens discovered that the use of a diet low in oxalates markedly reduced symptoms in children with autism and PDD. For example, the mother of an autistic son reported that he became more focused and calm, that he played better, that he walked better, and had a reduction in leg and feet pain after being on a low oxalate diet. Prior to the diet, her child could hardly walk up the stairs. After the diet, he walked up the stairs very easily. Many children with autism throughout the world are now being placed on this diet with good results. How Can Oxalates Be Treated? Implement a low-oxalate diet. This may be especially important if the individual has had Candida for long periods of time and there is high tissue oxalate buildup. Use antifungal drugs to reduce yeast and fungi that may be causing high oxalates. Children with autism frequently require years of antifungal treatment. Arabinose, a marker used for years for yeast/fungal overgrowth in the Organic Acids Test is correlated with high amounts of oxalates. Supplements of calcium and magnesium citrate can reduce oxalate absorption from the intestine. Citrate is the preferred calcium form to reduce oxalate because citrate also inhibits oxalate absorption from the intestinal tract. N-Acetyl glucosamine supplements can stimulate the production of the intercellular cement, hyaluronic acid, to reduce pain caused by oxalates. Chondroitin sulfate can prevent the formation of calcium oxalate crystals. Vitamin B6 is a cofactor for one of the enzymes that degrades oxalate in the body and has been shown to reduce oxalate production. Excessive fats in the diet may cause elevated oxalates if the fatty acids are poorly absorbed because of bile salt deficiency. If taurine is low, supplementation with taurine may help stimulate bile salt production (taurocholic acid), leading to better fatty acid absorption and diminished oxalate absorption. Probiotics may be very helpful in degrading oxalates in the intestine. Individuals with low amounts of oxalate-degrading bacteria are much more susceptible to kidney stones. Both Lactobacillus acidophilus and Bifidobacterium lactis have enzymes that degrade oxalates. Increase intake of essential omega-3 fatty acids, commonly found in fish oil and cod liver oil, which reduces oxalate problems. High amounts of the omega-6 fatty acid, arachidonic acid, are associated with increased oxalate problems. Meat from grain fed animals is high in arachidonic acid. Supplements of vitamin E, selenium, and arginine have been shown to reduce oxalate damage.